A very tasty single malt mystery story. The premiss of Chapter 7 is simple — each cask of Whisky is unique. The wood, age, temperature, location in the rickhouse … everything tells its own story. Even large single malts marry casks in large vats before bottling so that the Master Blander can try to make them all taste the same. 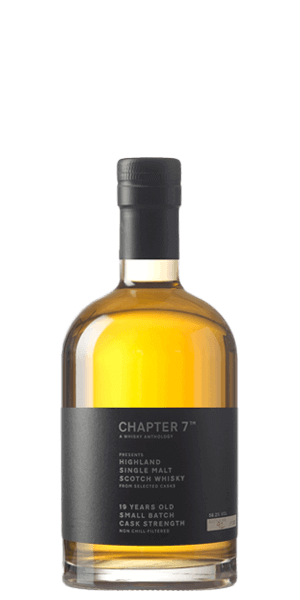 The folks at Chapter 7 Whisky think that’s a shame. Chapter 7 is the brainchild of Selim Evin. He thinks that each cask should tell its own unique tale, so he travels to Scotland and Ireland to hand select single casks from the inventories of the world’s greatest distilleries. Then he custom bottles each one with its own story. How many bottles you ask? Well, until the barrel is empty. Chapter 7™ Highland Small Batch 19 Year Old is unique, even for a company like Chapter 7. Not because they purchased a few casks of 19 YO, Sherry cask aged, Highland single malt Whisky (casks #796 & #1476). Heck, that’s their business model. But this time the distillery they got ‘em from made them agree not to mention the source — must be good stuff! Whisky lovers might be clued in by color, aroma, and flavor profile. Consider it a single malt mystery story where no matter who “done it,” you win … If you’re lucky enough to get one of the only 1076 bottles produced. What does Chapter 7 Highland Small Batch 19 Year Old taste like? The Flavor Spiral™ shows the most common flavors that you'll taste in Chapter 7 Highland Small Batch 19 Year Old and gives you a chance to have a taste of it before actually tasting it. Roasted peaches, rancio, fresh biscuits, and cream. Apple-pecan ice cream, lemon zest, and cranberry scones. Warm, long, and lightly sweet. A fine blend of flavors but a little more severe on the pallet. Not the smoothest but a good experience just the same. Did not taste like it was 19 years old. Very boozy. Not very much flavor at all. With the addition of a little cool water I tasted some oak and peat. The movie was much better.